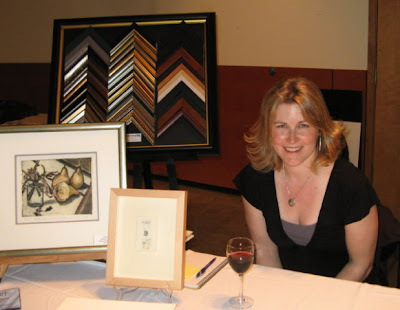 Malaspina Printmakers Society invited me to have a table to represent Frame of Mind at their bi-annual fundraising event “101 Prints 2007”. This year it was held at the Roundhouse Community Centre, which is an impressive building that has lots of open space to view the works. It was an exciting evening full of artists and collectors mingling and appreciating a multitude of talent. 101 Prints is a unique fundraising event put on bi-annually by Malaspina Printmakers Society in Granville Island. The way it works is there are 101 original prints by talented and well known artists in the city and 101 tickets for sale. The prints are displayed for you to preview, this is when you make your 1st, 2nd, 3rd choices. Every ticket is numbered, when your number is called you quickly choose the print you want and take it off the wall. You can buy more than one ticket and pick another print if you want, and that’s just what happened during the intermission. Most people had their first choice and still saw prints they liked so they bought more tickets before the night was over. As I predicted, the first piece to be chosen was the Gordon Smith print, then a Susan Point and then a Ross Penhall. All of the prints are worth more than the ticket price of $250. For example the Gordon Smith print which was the first chosen is worth $1200! All of the artists are very generous with their donations and believe in promoting printmaking and their artists. This is a perfect venue for such a cause and I was proud to be a part of it. This is such a creative and unique event that not only raises money and interest for the local printmakers in Malaspina, but is a fun and exciting way for collectors to pick up a print for much less then its original value.